Discussion in Sports & Fitness started by chiofthenorns • Sep 6, 2014. I prefer running outdoors than on a treadmill in a gym because for some reason, I feel sick when I am inside a gym. I make sure that I run every morning before work because that is the only time I have to exercise. Sadly, my running shoes have given up already. I checked sports stores last night, and I found out that there are so many brands today. My old brand was Nike. I'm considering to purchase one of these: Saucony, Brooks, ASICS, and New Balance. Which brand do you think is the best? I prefer New Balance shoes even though it makes me feel like an old person. My Grandmother actually bought me my first pair and I've never went back. I guess people who have walked for 80 years know a good shoe when they see one. New Balance offers a variety of different widths, something that I think is important in shoes but seldom offered. They also try to concentrate on how the shoe fits in ones heel - another feature of shoes that I constantly struggle with. When your shoe fits loose it creates friction and can cause blisters. I also like their designs. They have a variety of different designs available so that you don't even realize how many people are wearing them. I am a Nike person myself then but as they realease tons of shoes, I get confused as to what to get from them. The last running shoes I bought was Asics, 2 years ago. Still not showing any signs of wear since I only use it for my Sunday mile walk / jog. I would have to say that I have used Nike, Adidas, and Puma and I did not see any difference at all regarding performance. I guess as long as you buy a branded shoe then you can count that it would last for a long time as compared to the non-branded ones. I have purchased running shoes by New Balance, Saucony, Reebok and Brooks. I prefer New Balance because they make the best shoes for my feet. I have very low arches. The also have lots of cushion and last longer than the other brands. One the downside, they are heavier than the other running shoes. Thank you for all the suggestions, guys! I think I will settle for New Balance because of all the good reviews you mentioned and the ones I have read on other websites. Thanks again! 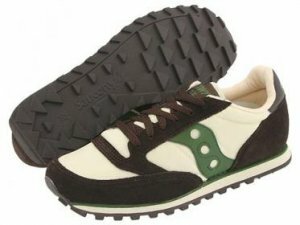 I am a firm believer of the old school saucony shoes. I went through a lot of shoes and brand over the years. All of which have lost touch of what makes a good wearable shoe. They have turned it more into a fashion show and marketing as such. I want a shoe that is breathable, flexible, and handles well off road. Behold.............what could be the best and ugliest shoe to ever been conceived. I had a pair of these in a different color back in 1992. since then I bought 2 more pairs until it was discontinued. They brought it back a few years later, but it didn't feel the same. Cutting corners perhaps? I'm a big fan of New Balance. I've been wearing their sneakers almost exclusively for years. I have the luxury of living not far from the New Balance factory in Skowhegan Maine, so I get to visit and take advantage of amazing deals on factory seconds. I find them to be incredibly comfortable and have a long lasting life, even as a heavy runner with extra wide feet. I don't think of anything when it comes to running shoes. Mine are Nike. I don't know and not sure how good others perform and how bad Nike performs relative to other brands of running shoes out there, but I am very satisfied with the Nike running shoes. It just feel great for my feet. They serve my feet well. So I keep on coming back to them and that I don't look for anything else. They are very durable and comfortable. I myself prefer to run on a treadmill inside of the gym, mainly because I like watching how many miles I ran/walked, how many calories I lost and the amount of time. Those are all conveniently right in front of you on a treadmill and you can monitor them all the time. Also, I feel self-conscious running on the streeet because people are Always looking at you. There aren't any good parks to run nearby either, so it makes things very difficult. My favorite pair for running if a pair by Reebok. I have tried Nike running shoes but hated them. They were hard and unflexible. Reebok has Always been nice for me, I have had 3 pairs of running shoes from this brand and they have Always been great. I have only tried two brands: Skechers and Saucony. I like both but I prefer my Saucony shoes a little more. They are both very comfortable and durable. I even use my Skechers shoes when strolling around. What type of shoes works best when you are running? I come across commercials and advertisements online for running shoes all the time. I can't begin to tell you which brand claims to offer the best results for those who run. I always thought shoes were shoes but I do believe there is a significant different with shoes made for running. I know when I bought a pair of Nike shoes a few months ago, I could feel the difference when I ran or did other workouts. My feet are at ease without too much stress on them. So, I stick with Nike. I myself was looking for some running shoes as a pair I had for 4 years just died, or should I say,on the outsole, it tore from the heel section all the way to the toe section. I normally just go to the store, try on what I see and like and if I like the feel I'll buy it, I don't think I'm a ''brand'' person, because sometimes, these "brands" don't make stuff as good as they once did, so might as well just buy what you like right? 'cause they're all the same. I just bought a pair of lightweight Reebok running shoes that seem very light and they are kind of of a minimalist type of shoe. Also these shoes had a very good price on them but they are made for more of a low mileage type of distance running. These shoes combine stability,flexibility, and percision cushioning so they sound like a great shoe for me to run or walk in as well.